With a casual modern design and privileged view over Nanjing Road, Mosaic presents an innovative menu focusing on organic culinary creations. Open for breakfast, lunch and dinner with buffet and a-la-carte menus available from 6am through to midnight. Chic and smart, yet relaxed and comfortable, 505 is a lounge bar providing a selection of teas and coffees during the day and champagne, wine and Sofitel cocktails in the evening, with a contemporary soundtrack to complete the scene. We enjoyed the Club Level happy hour in the lounge every night. The rooms are comfortable and well appointed. Service was excellent. Not value for money, overpriced. Room was very old and dark. The free coffee (stale and tasteless) that I had was enough to put me off from trying the rest of the F&B outlets. Overall, staffs were helpful and friendly but unfortunately, the hardware of the hotel is a complete turnoff and will not return as there are better value hotels around. Hotel is in a good location, rooms very comfortable, with good facilities. Satisfied.It was within my expectations. It was well within my expecttions. Comfortable but not the best i have stayed in China, the stay was ok nothing to shout home about. Other than that it is in the central of Shanghai close to all the great places to see and great night life. The room was small, poorly furnished, and the type that you wish to spend as little time in as possible. The whole hotel looks cheap - I am very surprised that it has a 4-star rating. I have stayed with this hotel on many occasions and always found the staff to be warm and professional. The hotel is perfectly located on Nanjing Road but is started to look a bit dated. This will not deter me from staying again next time I'm in Shanghai. Thank you to all the staff. Staff very friendly. The J Prime restaurant was fantastic! Great staff and very good menu, well cooked and presented food. Breakfast was disappointing and disorganised. Good hotel just at the walking path in central Shanghai. Nice rooms, good breakfaast. excellent hotel- stayed on the club floor. room was very nice..club facilities were excellent- both breakfast and afternoon tea were really nice. location is excellent- right in the heart of nanjing lu..close to transit /shops/sightseeing. staff was very helpful! It was generally good. But as we are not really in full winter and there’s no AC, the room tend to be quite hot. It was better when the room service help to open the window up. The location is very good but the standard of the hotel does not deserve to be call Sofital. I expect Sofital to come with certain standard. Apart from the location, there's really nothing good to say about this hotel. The coffee I had at the hotel was terrible (stale and tastless). Would definitely not return unless the hotel undergo a major renovation. Friendly professional staff with clean rooms. Very helpful staff. Hotel in a fabulous location. Liked that we could exchange currency at Reception. Terrific buffet breakfast. 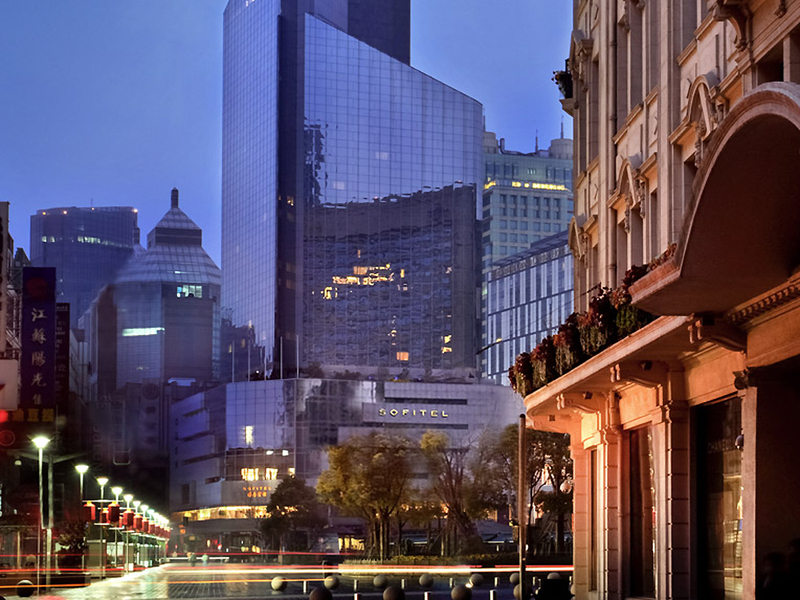 This was our second stay on holiday in this hotel and 5th in a Chinese city Sofitel .We chose it for the location in Shanghai, for which we don't think it can be beaten and its Executive Lounge . The staff particularly in the Executive Lounge are very professional pleasant and helpful however I would say the offerings other than the drinks available during Happy Hour were not up to the usual standard .We would suggest you use the main Restaurant for breakfast choice is much better and as it is a buffet style language is no problem.Bedrooms were not made up until late afternoon on two occassions coming back from our ramblings roomat 4.00pm were not made up so we had to use the Lounge while we waited .Afternoon tea in the lounge is a bit disappointing limited choice and poor choice of cakes -sandwiches left uncouvered and drying out would have thought the Western Chef who was checking out the afternoon Tea would have higher standards towards the French inspired patisseries.Would also comment that the seating in the reception area on 2nd floor is very limited so if we waiting for taxis or friends be prepared to stand .Hotel is still good but something has slipped not 5 star .Would I stay again yes but would not automatically put this hotel as first choice.